My kids and I went to the store one night this week in search of a birthday present for my mom. We discussed on the short drive there what we might purchase – What does Mana like? What is her favorite color? I was at first met with blank stares; then my 3-year-old daughter suggested either a big scooter or pillows. I can say with certainty that her grandmother would NOT want a scooter and I have no clue what she meant by “pillows!” But I had a suspicion that both items reflected her own desires more than what she believed her grandma would want! We get into the store. Oh, so many fun, distracting things!! Plus, it was near bedtime on a school night – so it was a major challenge to keep them corralled! Now that we’re in the store, the birthday gift ideas really started to flow! How about bubbles, or these pink beads, or this skein of yarn, or a bright green St. Patrick’s day hat with clovers dangling from the sides? 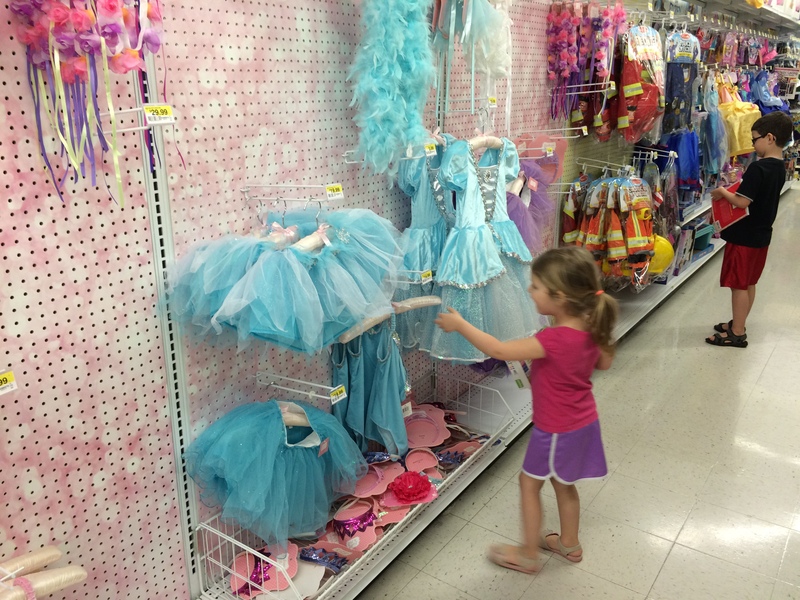 Or, better yet, how about something from this wall of children’s dress-up clothes?!? We ultimately decided to go with a grown-up coloring book, filled with pictures of butterflies and birds, both things my mom likes. The kids sincerely picked this gift on their own – and because it is from them in love, the gift will be received with joy. And, in turn, as they witness the joy in their grandma’s response, both of my kids will experience their own joy and happiness; thus proving that giving to others in love produces joy for all. I’ve continued to ponder this story through the week, laughing over the gift ideas of my young children. I began to consider how much easier it is to be focused on our own wants and needs instead of those of the people around us… “I work hard to buy things for myself, or afford this trip I want to take.” Or “I have a schedule each day and I want to stay on task with my own to do list.” If someone gets in the way of acquiring the things I want or think I need, it is a perceived inconvenience. Which means that I believe my wants are somehow more important than wants and needs of others! Like my kids with the birthday gift for grandma, we too will experience joy when we recognize and then fulfill needs of others. This is a different joy – often a greater joy – than the pleasure we feel when we acquire something we want for ourselves. We live in a materialistic society, one that glorifies acquired wealth and individual accomplishments. So, it takes commitment, intent and many reminders – to look beyond ourselves and focus on the needs of others through gifts of time or wealth. There we find joy, love, peace – divine gifts of a loving God who knows through experience that it is far better to give than to receive! Categories: Parenting, Serving Others | Tags: birthday, faith, gifts, God, kids, needs, parents, selfish, shopping, wants | Permalink.